Here’s an Easter post. Never let it be said I ignore the season. I can’t recall where I first was introduced to the fact that the Gospel resurrection scenes show a distinct development of details according to the relative dates of the Gospels. Look at how each one appears to build on or surpass what had been written before. The Gospel of Mark, the earliest Gospel, actually has no resurrection scene at all. The women come to the tomb, see a young man in the tomb, then run off in fear. (Bibles that continue the story past verse 8 are incorporating what most scholars acknowledge is a passage that was not original to the Gospel. Someone much later attempted to cobble details from both Matthew and Luke to create what they presumably thought was a more satisfying conclusion.) The young man does tell the women that Jesus can be seen again in Galilee if they go there. And that’s it. There is no actual appearance of a resurrected Jesus in this Gospel. 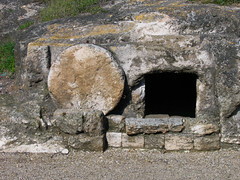 Before that scene the author struggled to find a way to have Jesus appear near the tomb itself. After an angel (Matthew transformed Mark’s “young man” into an overpowering and glorious angel) told the women to go tell the disciples to find Jesus in Galilee, Jesus himself appears in front of them and robotically repeats the same message. Or is this so crudely done that we must suspect a later redactor of adding this vignette? So we can say “Matthew” created the first resurrection scene. He based his scene on “Mark’s” young man’s announcement of what the disciples could expect to see when they returned to Galilee. However, later evangelists seemed to have found that rather bland. There are quite a number of indications of Markan and Matthean influence in John’s Gospel. (Some believe its author knew all three synoptic gospels — Mark, Matthew and Luke.) Clearly its author was not happy with the resurrection appearances in either Mark or Matthew. He had the resurrected Jesus appear to Mary and here we find for the first time some personal drama added to the event. Mary is moved enough when she recognizes Jesus for Jesus to quickly order her not to touch him. (Matthew’s two Marys had worshipfully held the feet of Jesus.) He has yet to ascend to heaven and return again before any mortal is allowed to touch him. It’s morning when this happens. After an all day return trip to his Father’s throne just above the clouds he returns in the evening by materializing in the middle of a closed room to be seen by his disciples. This time the disciples are also said to be very happy, and Jesus then breathes on them to give them the Holy Spirit. So we are now getting pretty close to physical contact. Then Thomas the latecomer is the next to see him and Jesus tells him to touch him, even to put his whole hand in the spear-hole in his side. Thomas refrains from doing so, it seems, since Jesus commends him faintly for believing merely on seeing him. All these scenes happened in Jerusalem. (Was “John” drawing upon an early version of Luke’s Gospel that contained a Jerusalem appearance?) But he apparently felt he had to do something to match the Mark and Matthew accounts of Jesus appearing in Galilee. (I know, many readers may be thinking it was a later redactor who added this final chapter. Possibly. But we can’t be certain of that, especially once we learn more about ancient literary styles.) So this time Jesus does more than just appear to his disciples: he starts a fire and then feeds them all some breakfast. The resurrection appearances of Jesus are becoming much more “substantial” now. Jesus is still very much a spirit, but he is mixing more with his folks, being confused for a gardener at first by Mary, doing substantial things to prove his post-mortem real existence. Now for the final redaction of Luke. This was when its story was developed in a way that segued into Acts. Luke builds up the scenes in step by step dramatic stages. First Jesus appears as an unrecognized country wanderer. He is invited in by strangers for a meal and overnight stay, and once again Jesus breaks bread for them but then disappears. His two hosts run back to tell the other disciples and add that Jesus had also made an off-stage appearance to Simon Peter. Jesus himself scares them out of their wits by suddenly appearing out of nowhere. Luke’s portrayal of emotional responses is a little more realistic than what we read in John. Jesus then reassures them all by inviting them to touch him, though they seem too coy to actually go that far. He even says they can touch him because “a spirit has not flesh and bones — as you see I have”. So he orders some fish and honeycomb for dinner and then eats it all up while they watch. So he presumably had a stomach and an appetite, too. Not only that, but Jesus stayed with them for forty days like this. Finally he was taken up into heaven on a cloud. Ten days later the Holy Spirit fell upon them all. Evolution happening before our eyes! So we can see how a story grows with the telling. Successive authors appear to have built upon frameworks that had been constructed by those before until we go from a mere reported appearance yet to happen right through to a series of appearances with physical and personally dramatic interactions and even suggestions that the resurrected body is not even a spirit. Posted on 2013-03-31 23:02:43 GMT+0000 by Neil Godfrey. This entry was posted in Resurrection appearances and tagged Resurrection appearances of Jesus. Bookmark the permalink. Darn it, I overlooked the scene in Matthew Jesus appearing to the women as they ran to tell the disciples. Have edited the post to include this now, thanks. NG, you mean Matthew’s Mary right? Of course. Thanks. Fixed now. 3 For I delivered unto you first of all that which I also received, how that Christ died for our sins according to the scriptures; 4 And that he was buried, and that he rose again the third day according to the scriptures: 5 And that he was seen of Cephas, then of the twelve: 6 After that, he was seen of above five hundred brethren at once; of whom the greater part remain unto this present, but some are fallen asleep. 7 After that, he was seen of James; then of all the apostles. (But of course no doubt Paul is a myth as well as Jesus!). Are you offended that my post incidentally gives cause for some doubt as to the historicity of the resurrection appearances of Jesus in the Gospels? And of course the point of 1 Corinthians 15 is to establish for readers that Paul’s experience of the resurrected Jesus was no different in any way from that of the other apostles. So unless we want to argue Paul’s experience was something more than either a vision or inner revelation . . . .
And we know from 1 Corinthians 15 that early Christian converts must have openly scoffed at the very idea of their god choosing to raise corpses. Paul calls such people fools and tells them that Jesus ‘became a life-giving spirit’. To Paul , it was simply idiocy to reject Christianity just because the body of Jesus was still in a grave. ‘If there is a natural body, there is also a spiritual body’. Paul often uses ‘tent’, or ‘clothing’ metaphors to describe resurrection – both imply leaving one thing and moving into another thing. How do you put a new body on top of a corpse? Normally, when you change clothes, you take the old clothes off and put the new ones on. 1.71 — Flight to Jericho. This story was evolved by oral tradition and later on engulfed by pagan christian mythologists and added to the their Jesus mythology. The real Christ of the era, James the Just, was degraded to be the brother of Jesus. If you care to remove christian interpolations from the books of Josephus you´ll find that James was widely known as the Christ. We can also learn from Josephus that it was Vitellus who rode in to Jerusalem during passover and was magnificently received. Tangential question: I’ve heard it said the NT doesn’t contain the Trinity Doctrine, but the commandment (The Great?) in Matthew seems close enough to challenge that statement. What saith the Vridar? It’s been a long time since I’ve read anything on the trinity and I don’t know what current scholarship has to say about it. My understanding is that it only becomes an issue well after Christianity has established itself. I’m more interested in the controversies over Christian origins and the background to the appearances and worship of the Jesus figure. Tim may know more about the relevance of the passage in Matthew 28:19 to your question. The discussion of Matt. 28:19 begins on p. 102. Note especially how Eusebius quotes this passage (p. 104ff.). Speaking of evolution: in the Gospel of Luke, Jesus only stays 1 day with the disciples. It’s not spelled out as such, but that’s the impression the text gives: “Now on that same day two of them were going to a village called Emmaus […] That same hour they got up and returned to Jerusalem; […] While they were talking about this, Jesus himself stood among them […] Then he led them out as far as Bethany, and, lifting up his hands, he blessed them“. In Acts we’re told he stayed “many days”, “But God raised him from the dead; and for many days he appeared to those who came up with him from Galilee to Jerusalem” (Acts 13:30-31). In fact (as we all know) Jesus stayed 40 days (Acts 1:3) before flying away, not from Bethany (Luke 24:50), but from “the mount called Olivet” (Acts 1:12). That photo of a tomb? The first time I saw that photo, years ago, my immediate, visceral reaction, was that it was the sort of place out of which zombies were about to come shambling. Some time after that, I was thinking about a scene in a fictional work I was dabbling in. A believer is having a vision-like experience; there’s a soft, misty, golden light everywhere, and a figure in a gleaming white shroud standing facing away. The believer approaches, the shrouded figure begins turning, it all proceeds slowly and dreamlike, such that as the believer reaches the figure, ready to embrace it, the figure has just completed turning around, and it can be seen inside its shroud to be a rotting animate corpse, leaning in to kiss with foetid breath. Ever since, I can’t get those two images out of my head whenever I think about Christianity. 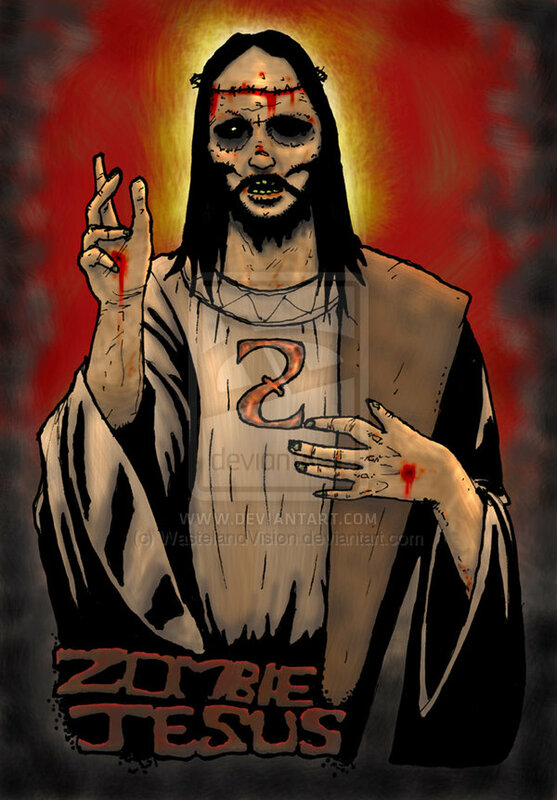 What about ‘the sons of Zebedee’ as evidence that John 21 is a late addition?